JF: I am 22 years old. College educated in art and audio engineering. As a kid my family put me in gymnastics, martial arts, 4H and other clubs. I was born with one short leg, on the left, which is missing a femur bone. And no leg on the right. It is a very rare condition and I have never met anyone else just like me. I also have four toes on my left leg, and two fingers on my left hand were webbed at birth - but were cut apart surgically when I was two years old. Growing up, I moved all over the country. I have always been a performer - in school, and outside - doing plays. I have also played guitar for about six years, and have been singing my whole life. 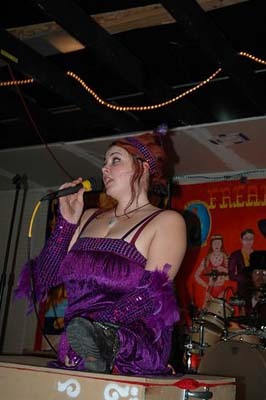 I had been performing long before I joined the Freakshow. I used to run around on my hands and foot all the time when I was a kid and was very active. I have always been how I am, and, that being my reality, I don’t feel like it is different. It is not hard for me to do things that other people do. I consider it an “alternative” life-style. 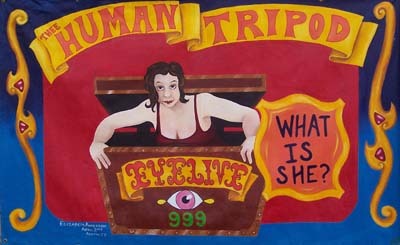 I have been involved in the 999 EYES genuine freakshow for three years. JF: I heard Samantha X (freak momma of the 999 EYES of Endless Dream) do a freak call-out on the radio when I was living in Oregon and finishing up college. I was sitting with my friend when they were promoting their upcoming show. I joked that I should join because of my background and my odd talents. I didn’t think they had real freaks, I thought they were just a sideshow because I thought that all those shows were long gone. They announced their tour dates and where they were traveling to, and it sounded like a really fun tour. Then I said to my friend, “I’m going to go down there and join” and I did. I liked them automatically, even though I had never known them at all before, and packed my bags. I left with them for my first two-month tour and it turned out to be one of the biggest moments in my life. I hadn't considered doing something like this before because I had never heard of a freak show existing. After I joined it was like an epiphany and I found myself thinking, “Why hadn’t I thought of this before? It’s just perfect!” After touring I started delving deeply into the history of the freakshow and was just blown away. SSW: A freak call out…I’ve never heard that expression. Would you tell us about it, how it was presented and the key elements that caught your attention? JF: We do this thing when we are touring, usually on the radio but also at our shows too, it’s called a “freak call-out”. When I first heard it, Samantha X was talking about the performers in the show. She would say, “Are you bored with the mundane hum an body withhomogenized culture? One head, ten fingers, ten toes? Well, my babies have seven fingers and four toes.” Then she said, “If you have two heads, missing limbs, skin conditions and want to join us we are always looking for new human anomalies.” At the shows we have a “freak call-out” in which we invite people in the audience to share their abnormalities and we tell them if, in fact, they are a freak. When I heard what they were looking for I thought I fit the description and I knew that I would be perfect, plus I wanted to travel. SSW: You said, “I had never heard of a freak show“. Does this mean you were unaware of the displaying of human anomalies in midway sideshows? JF: I knew a little bit about them. I saw Todd Browning’s movie Freaks when I was a teenager, but I didn’t know about the history that much. I figured it was long gone. JF: When I am with my friends and family I am not a freak, it is when I transform into my character that I become a freak in the truest sense. The term doesn’t offend me. In the generation that I grew up in freak meant something totally different. People called themselves freak with pride, meaning that they were strange and unique. Now that I work in the show and know the history I want to reclaim the term freak in what it really means, that being a born human anomaly who performs in a freakshow. Not everybody who is born different is a freak, it is something that you choose to be. In my opinion words only have as much power as you allow them too. The meaning of words changes in how you use them and it which context. You can embrace them or regard them as degrading words. I wear the title of freak with pride. I am proud to be different and I want to share what I can do with people and encourage them to be proud of who they are no matter what they look like. To me it is a celebration of diversity. JF: Luckily I found art, performance and music at an early age so I had something to channel my energy, joy, and frustration into. Growing up is hard for everyone no matter how you were born. I was never teased or picked-on more then the next person. I was generally well liked. It’s all relative as to what is difficult for people individually. Especially when you look at other countries, war-torn nations, and poverty around the globe. It ma kes you think, wow, I’m getting wrapped up in these problems that seem so epic but are minuscule problems comparably. JF: I think it’s actually made me feel even more comfortable with myself. I’m not hiding anything or trying to be something I am not. I don’t have to use a wheelchair or crutches I can run around on my hands and do cartwheels and handstands. When I got older I stopped doing stuff like that. I got more self-conscience and didn’t want to be running around on the ground anymore so I stopped for a long time. When I started walking around like this and performing I really liked it. It never stopped being fun, I just forgot how fun it was. A lot of people I had known for years didn’t know I could do all these things with my body. People see me in a wheelchair or on my crutches and don’t know I can do all these things so it’s fun to show people. Plus most people have never seen anyone move around like I do, so it’s surprising, and very interesting for them. SSW: How has it changed your life? For the better, worse? JF: Definitely for the better. Sometimes I think about what my life would be like if I had not have met the freak show and it makes me laugh because I can’t imagine it not being my life. It just seems so perfect. The freakshow has connected me with so many amazing people and intense experiences that I would never get anywhere else. I now have a freak family and community as well as my blood family. I always wanted to be in show business when I was young, but figured I couldn’t be successful. Boy, was I wrong! I feel like I have a niche now. I have something that no one else has and instead of that being a bad thing it is a good thing. I guess it has effected me in a bad way, because, now that I have spent a lot of time doing this and have realized how amazing it is. It would be hard for me to be happy working a normal depressing job. SSW: You have a freak family. Could you explain how the group functions as a family? JF: We are all really supportive to each other in everything, not just our show. We have been together for years, traveling the country and performing for thousands of people. We are very close. Now we all live in the same town literally blocks away from each other. At one house we have Samantha X, her children, D. M. Blackthorn (our accordion player in THAT Damned Band), Lowrent the Clown, and Lobster Girl. Down the street is me, St. John (our drummer and flipper boy) and Tommy the sword swallower (aka the Great Gozleone). We hang out a lot together. Many people in our projects have children who I consider my friends and we babysit for each other and spend holidays together. We are a family. SSW: The show community is a closed group for the most part, they take care of their own. Historically when folks were out on the road the Townie's were outsiders to the show folks, and the locals had a lot of mistrust of show people. What has your experience been in your travels and do you think they are different than what others have experienced? JF: When we go town to town, I feel like people love the show and it is often a new experience. Our troupe is irreplaceable, you can’t call a temp agency and ask for another human tripod that can do karate and sing. It seems the audiences realizes this when they see our show - they realize what an amazing thing it is. We want people to feel comfortable with us, and not be alienated. We are trying to better the world. Traveling with a show like this is defiantly different than traveling by other means. I think it enriches the experience. A lot of times, we have an effect on people in a really intense way - we have people coming up to us and sharing their abnormalities. They feel relieved that they have found someone who understands. It empowers some people. It’s also a good show, it is something you can’t see anywhere else. SSW: What does your family think of you working in the sideshow? Have they been supportive or do they think you have lost your mind? JF: When I first mentioned it to my Mother, I think initially she was shocked, I mean I just called her and said "mom, I'm leaving in 4 days on tour with a freak show" At first she didn’t really understand, and kind of was like, ‘Jackie, why are you doing something like this? You don’t have to join a fr eak show.’ I thought she would be instantly excited because I was. I don't think she really knew what a freak show was either. It wasn’t even in her generation. I’m really close to my mother. I love her dearly and wanted to have her support. I attribute her fully for how I am today. She never treated me any differently than any other kid. I talked more about it, explained to her about what I was doing and why I was doing it and she warmed up to the idea. Basically, my reasoning is that it gives me a chance to share all these talents I have. There really is nowhere else I could do the things I do on stage. I mean, am I supposed to go on American Idol or something and start flipping around and karate chopping boards? I don’t find working in the freak show is any more exploitative than any other form of entertainment, including the plays and music I did before the show. I think everyone in entertainment is exploiting themselves in some way. My Father just doesn't get it at all! He lives in a small town in the Midwest and is basically deprived of any entertainment so he doesn’t have anything to compare it to. SSW: I've felt like an outsider most of my life, I like things outside of the norms, that's one of the reasons I enjoy the shock and amazement of the sideshow, would you give us some idea of how you feel you fit into the world and how has that effected where you now are in your life? JF: I feel like I have always been a pretty eclectic person who was into the strange, into art, and seeing the bizarre as beautiful. I always hung around strange and interesting folk, because they are all over the world, and I tend to draw them to me. I’m a sucker for an interesting story and there are tons out there. I feel really bad when I hear about and think about people, especially teenagers, who just don’t fit in anywhere and feel so alone. They don’t know that there are people out there like them. Many people find their place in the sideshow. I feel like I found my place there. SSW: It is human nature to look at people that appear different. How do you feel about people staring or pointing when they see you out in public? How is the experience different than when you are with your freak family? SSW: Could you tell us about your group’s stage show? 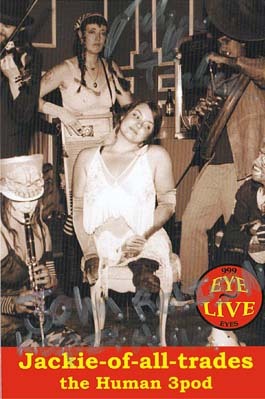 JF: The 999 EYES show is a variety show of sorts. 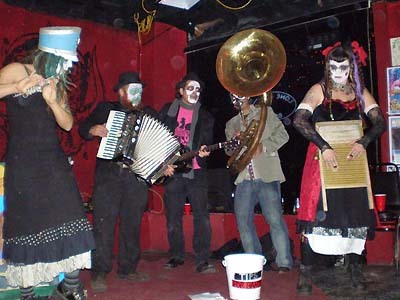 We have a live jug band that consists of an accordion player, flute, clarinet, musical saw, wash tub bass, washboard player, fiddle, tuba, guitar and jug. The band is called THAT Dammned Band, and they play music throughout the whole show. Then we have the freaks, which consist of me, lobster boy, lobster girl, Stn. John the Flipper Boy, Ken ‘Peggo the Lego’ ‘the modern day elephant man’, Diedre the ‘Dancing Dwarf Demure’, as well as other freaks who perform on occasion with us, like lil’ miss Fire Fly the ‘midget of mischief’, Danny the half-boy, and a few different giants. We also have some sideshow performers including a sword swallower (the Great Gozleone), Lowrent the Clown, and occasionally Katzen the Tiger Lady. Our show involves music, vaudeville, traditional freakshow acts and working acts, as well as ones we’ve created. The show is really diverse. SSW: What types of venues do you play? JF: We have played so many different venues. We’ve played at festivals, bars, frat houses, churches, resorts, benefit shows, colleges, and theatres all over. SSW: Do you have much time off? What do you like to do in your free time? JF: I do have time off. This year has been the most intense as far as no time off. By the end of this year I have been touring eight months out of twelve. I intertwine my work with my pleasure. When I have time off I usually relax, work on acts, play music, go out, play pool and read. SSW: Since you’ve been in the business who have you worked with? JF: I work primarily with 999 EYES, but I have done shows with Brothers Grim. The tour that I was on with them I worked with Zamora the Torture king, William Dark, a few yo-yo masters, go-go Amy, Lady Diabla the sword swallower, and lil’ miss Fire Fly. I worked at circus circus casino with the Lizardman and Swingshift sideshow. Dan Meyer, president of the Sword Swallowing Association International, just came out to do a show with us. I’ve done some shows with a Portland circus called the Wonderlust circus. I’ve worked with a lot of bands too. It’s still my preference to do shows with other freaks though. SSW: How has the experience changed what you think of the business? JF: I like working with different groups because everyone has their own acts and different spins on things. Especially, the way they present their shows. It’s also been interesting to see what a sideshow is like compared to the freak show. Like any business there are bad ones out there that just care about money and not the people performing for them or the history behind the show. Luckily, with the 999 EYES, I’m with a good group of people who share the same vision with me. Our show is co-created, and we all make the show together. I like not having an authority figure who is on a power trip about being the boss. I don’t want to feel like I’m below someone and I have to do what they say and be controlled by them. In reality, a show is not a show without all the people involved, no matter how small their part might seem. When someone is performing with you, they are there because they want to be, and they can just as easily leave if you don’t treat them right and appreciate the work they do. SSW: What are your aspirations for the future? JF: I would like to do more TV and movies and get the freaks back on the big screen instead of just using CGI effects and hiring people to act like they are in wheelchairs. I don’t think there is anyone to look up to in the entertainment world who is not a cookie cutter person. I am tired of people who are “handicap” being looked down on and pitied. It’s ridiculous. I want more freaks to come out of hiding and share what they were born with. I would also like to meet a conjoined twin in person. Generally, I want people to accept themselves and others and be more understanding and accepting as a society. SSW: Would you give us an idea where you see the Freak Show is heading? JF: I think NOW is a great time for the freak show. People are really interested in it. I think the future looks bright. SSW: Is there anyone you would like to thank? JF: I would like to thank Samantha X, Lowrent the clown, Dylan and HEA (the lobster girl) for all the work they have done for the 999EYES. It's a lot of work to keep the dream alive. I would like to also thank all the human oddities I have worked with and the wonderful musicians in THAT DAMNNED Band. John Strong, Bobby Renyolds, Ward Hall and Jimmy Z. Special thanks to Josh Blatzik and Elizabeth Anderson for the beautiful banners they painted for me. Everyone who supported us from the beginning. Also Lady Diabla and Zamora the Torture King. 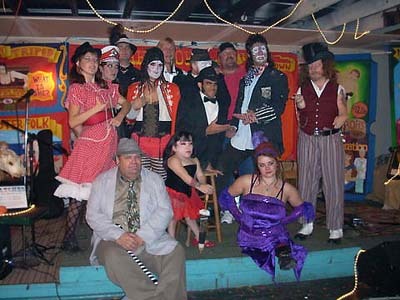 Last but not least all the freaks and great showmen of the past that created the history and legacy of the freakshow. 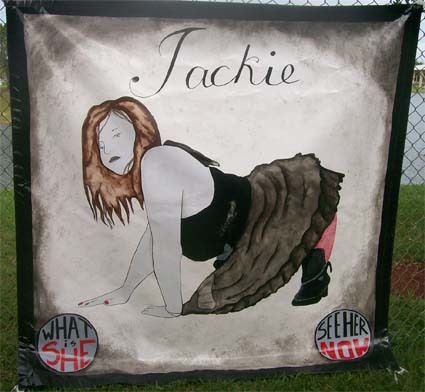 We'd like to thank Jackie for taking time to do this interview for Sideshow World.